I’m pleased to say that I have been building Natural Buildings for a number of years now. My work has taken me up and down the West coast of North America, with a focus in the Pacific Northwest. I’ve been calling Vancouver Island home for the last three years, and have had the pleasure of working on some amazing Natural Homes in the area. From cob to straw bale to light clay infill, many of these homes have been breaking new ground and setting new examples in terms of highly efficient and sustainable dwellings. Eagleyew is easily at the forefront of this list. 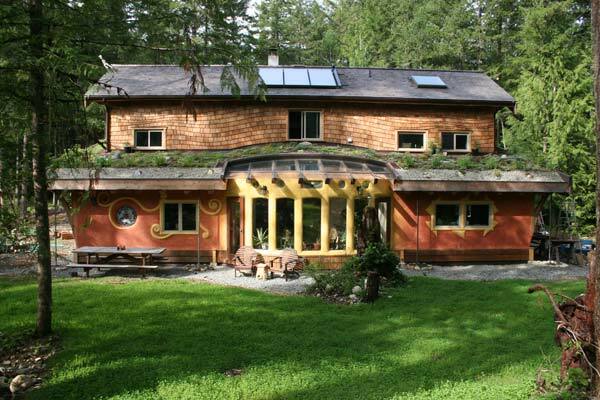 Eagleyew is a family home located in the moderate climate of Vancouver Island, B.C., Canada. 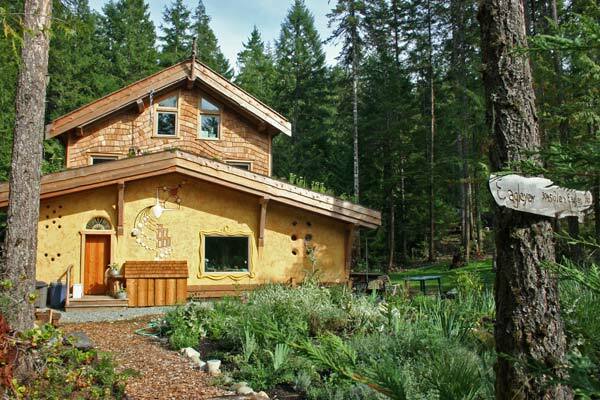 This 3400 sq ft, three-story house is built nearly entirely of natural materials. With a robust timber frame, stave and light clay infill walls, an Annualized Geo Solar (AGS) system, solar hot water, a masonry stove, earthen floors and plasters, and even a living roof, this home is truly leading the way in building sustainability. Encompassing both active and passive solar energy, wood heating, and the use of natural materials, makes Eagleyew stand out in the realm of home efficiency. 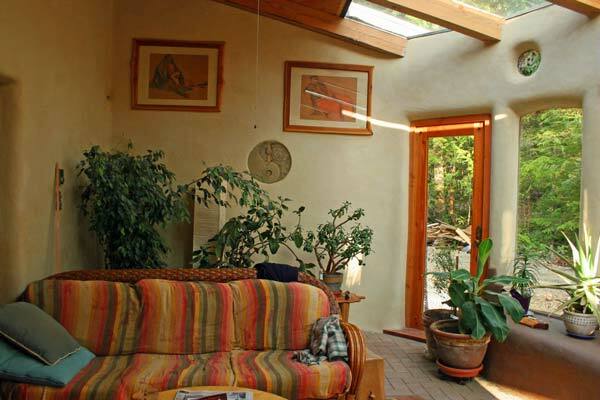 The AGS heating and cooling system helps maintain a stable temperature, the masonry stove gives a boost of heat whenever needed, the solarium provides a warm, bright, and cozy place to relax, and the thermal mass of the walls and floors provide the perfect storage for slow-releasing heat. All of this combines to create an extremely comfortable indoor temperature with minimal human input. Three solar hot water panels on the roof support the AGS system while also supplying hot water for household use. A heat exchanger with hot glycol captures the heat from the sun and transfers it to the water in the boiler. Once heated, the water is pumped into the tubing at the centre of the house, 6 feet underground. The heat from this tubing radiates out and up, slowly spreading across the entire floor area. The best part about this is that the heat moves through the floor at a rate in which heat captured in the summer is released and enjoyed during the winter. 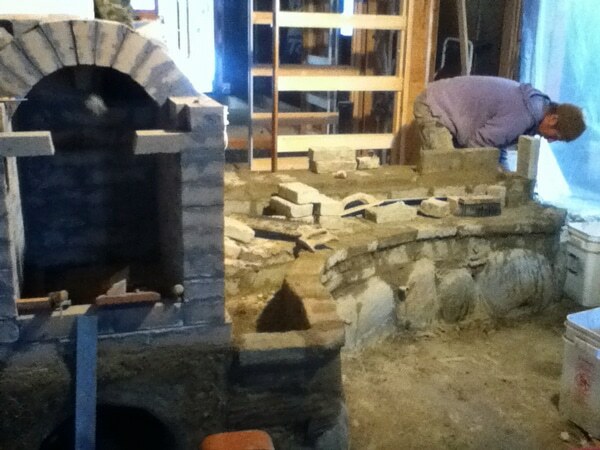 When extra heat is needed, the owner fires up his Northern European style masonry stove. Masonry stoves are extremely efficient and require a far shorter burn time than a fireplace or cast-iron stove. The large thermal mass that makes up a masonry stove is a great battery in which to store the heat created. This heat radiates out from the mass evenly and slowly, keeping the air temperature of the entire home at a comfortable and stable level. Eagleyew’s masonry stove “gets fired once a day, and the effects are felt for a good 18 to 24 hours following a burn” says homeowner Ezio Cusi. Masonry stoves are also healthier. With the wood being burned at very high temperatures, there is a more efficient burning of the fuel, which results in less pollution. One can truly breathe easy knowing their home is heated with these two highly efficient systems. 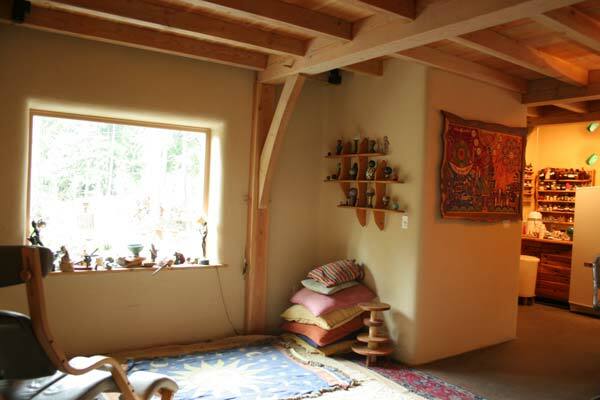 It is also easier to breathe living within walls made largely of clay and natural materials. Clay has been used to cleanse the body of toxins for years. We are fortunate that it does a real good job of helping cleanse the air as well. Without getting too scientific on you, the properties of clay allow it to breathe and absorb both moisture and toxins from the air, acting much like a sponge and filter. Both these actions help create an ideal indoor air quality. Regulating humidity levels in the home not only creates comfortable indoor air quality, it also helps avoid the development of mould. Clay based walls perform well when it comes to absorbing and pulling excess moisture away from mould vulnerable areas. The hygroscopic qualities of clay not only enable clay to absorb vapours from the air, but also enable these vapours to be absorbed at a fairly fast rate, quickly regulating the relative humidity in the home. Clay also has a stronger capillary draw than timber, enabling the clay walls in Eagleyew to draw any moisture out and away from the adjoining timber frame, which, in turn, helps avoid microbial growths. Clay is negatively charged when hydrated, even slightly, causing the sponge effect to kick in and attract and capture positive ions and electromagnetic radiation (EMR). Positive ions create free radicals, which can lead to vulnerability towards illness and disease. The woodchip clay infill walls of Eagleyew are exceptionally effective in protecting the residents against the many electromagnetic currents zipping around outside the house as well as inside. Anything that operates on a wireless signal is sending out an incredible amount of these electromagnetic currents, and thick, natural walls are one of our best defences. Eagleyew boasts 12-inch thick woodchip clay infill walls, a great buffer against outdoor EMRs. This particular mix, of clay covered wood shavings, also provides a good balance between insulation and thermal mass by being dense enough to store heat, yet also able to trap enough air to provide plenty of insulation. Being located in a moderate climate allows for such a balance to be struck while not compromising any comfort for the residents. These walls are a key factor in the high performance levels experienced from the various systems and design elements found throughout the home. All of these elements work together to provide a home that requires minimal input to maintain a comfortable indoor air temperature and incredible air quality, meaning fewer bills and a healthier home for the residents. Q: Why did you choose to build with natural materials? Q: What did you enjoy about the construction phase of Eagleyew? Q: What do you enjoy about living in Eagleyew? Yet the story doesn’t stop here; Eagleyew is also one of the most beautiful and creative homes I’ve had the pleasure to work on. 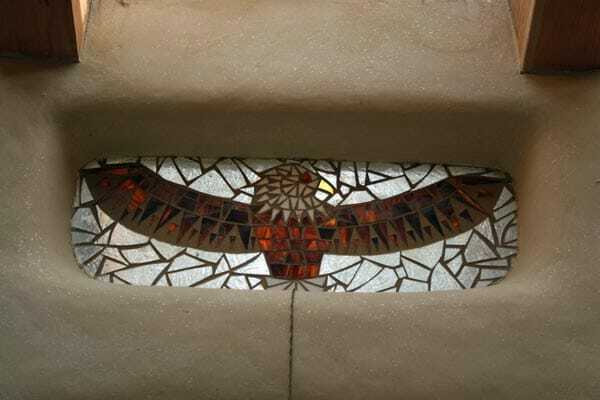 With soft earthen plasters, creative truth windows, cob benches and sculptures, a rammed earth kitchen island, and even some of my custom glass mosaic windows, Eagleyew is a house of art, passion, and creativity. These pictures are worth more than 1000 of my words, so I leave you with them to conclude this story. Follow me for the full gallery at Earthen Built. 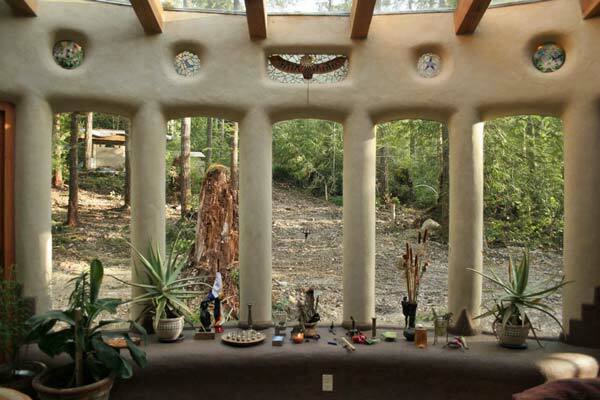 Kata Polano is the owner/operator of Earthen Built, which specializes in the Artistry of Natural Building, Design, and Detail. She has been building with the earth since 2008, offering clients a healthy and creative alternative for their built environment. She currently lives in the West Kootenays, British Columbia, Canada.